There's very little in crochet that hasn't been done before in some shape or form. It's particularly galling to have an idea...and discover it's already been done. 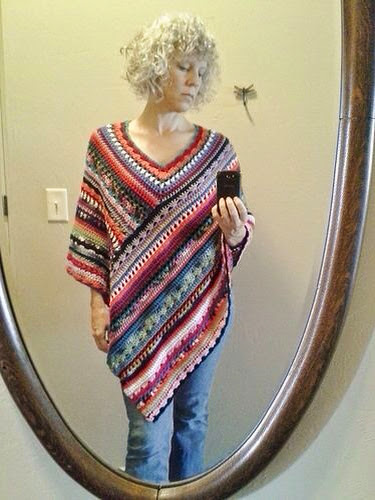 I hooked a poncho for a housemate's mum last year, it was a pretty pattern, and the poncho was made from two rectangle pieces, adding extra interest in the design. Lucy, from Attic 24, also hooked a poncho, which looked deliciously warm. And popular of late is the different stitch pattern blankets, and mandalas. All giving me an idea for a freeform poncho using the basic rectangle construction. Ok, not exactly as I envisaged, but close.